Tips and fun activities for our guests vacationing at the luxurious Beach Villa's Resort in Ko Olina, Oahu, Hawaii. Enjoy luxurious 2 & 3 bedroom condos on the beach with full kitchens containing Sub Zero, Fisher-Paykel and Wolf appliances. The villas are finished out with Travertine Floors and African Sappeli Wood Trim. Ocean front location on the quite western shores of Oahu, about a 20 minute drive from the airport. From the time the Disney Aulani Resort and Spa first opened, the world wide press has been beating down their door. We appreciate the attention, as it provides a nice experience for our guests staying at the Beach Villa Resort at Ko Olina next door as well. Ama Ama (the Hawaiian word for small mullet) is the resorts fine dining option. The restaurant is right on the water and it's the first place you'll see, when walking over from the Beach Villas. Ama Ama is open for breakfast 7-11 a.m., lunch 11:30 a.m.-3 p.m., and dinner 5:30-10 p.m. with each service having it's own distinct breakfast menu, lunch menu & dinner menu. Within Ama Ama there are three seating areas, the first representing 1890's Hawaii, the next 1940's Hawaii, and the last, present day Hawaii. Breakfast, order dishes that have Fried Rice and/or Portuguese sausage in them. Yum Yum! Lunch, have the local plate lunch, your in luck if it's a day when they're serving the Hawaiian lunch with lomi lomi salmon, chicken long rice, poke, kalua pig, fresh catch of the day, pulehu (the Hawaiian word for "broil over a fire") meat and furikake (a Japanese mixture of dried bonito flakes and seaweed) which is sprinkled over rice. The other local plate lunches are typically good as well. Appetizers start at around $10, entrees range from $12-30, and desserts and cocktails are $10. There's a separate keiki menu where you choose an entree and either an appetizer or a dessert. During the dinner hour, enjoy excellent live hapa haole and jazz music to get you in a Hawaiian state of mind. To further the mood, order the Aulani Wave, made with coconut rum, a mango-and-passion-fruit liqueur, and pineapple juice. Perfect! Dinner entrees such as the fresh catch of the day or a grilled steak range from $30.00 - $60.00. The Kahuku Corn Chowder is a favorite as a starter. Expect to spend on average, around $300.00 for dinner for four. Breakfast and lunch are less. After dinner, walk over to the fire pit right outside of Ama Ama and enjoy fireside storytelling under the stars. Another perfect day in paradise! 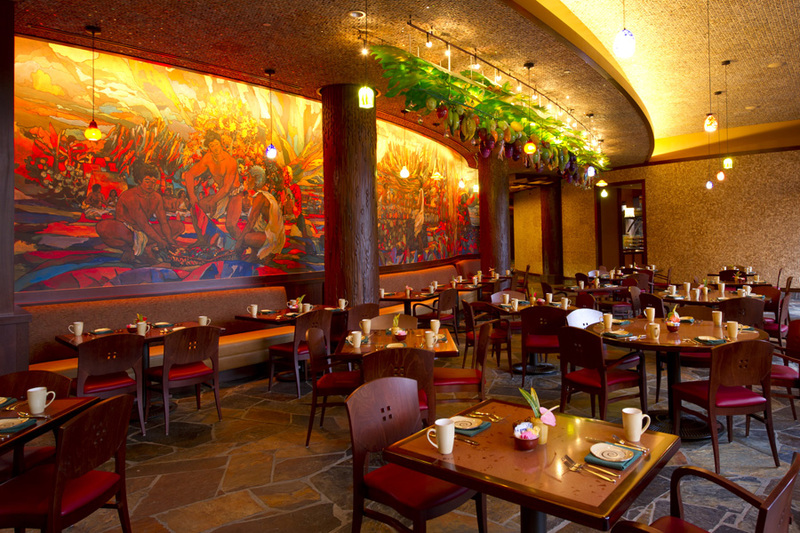 Makahiki (Hawaiian for the New Year and Winter celebration) is the buffet restaurant at Aulani. Breakfast and dinner are served and the last time I checked, the buffet was around $32.00 for the Character Breakfast on Wednesdays, Saturdays, and Sundays, $27.00 for the non Character Breakfast and $43.00 for Dinner. Make reservations in advance as the restaurant is quite busy on character breakfast days and the weekends. At breakfast, you may have traditional American food such as Mickey waffles, pancakes, bacon and eggs including an omelet station; Japanese food (lots of Japanese visitors) with the traditional Japanese breakfast of miso soup with dried seaweed, pickled vegetables and rice; Chinese food includes dim sum (steamed buns with BBQ pork, shrimp dumplings and pork xiao mai) and congee (Chinese porridge). The dinner buffet contains items such as sushi, crab legs, shrimp cocktail, raw oysters, fresh seafood, a prime rib carving station, guava BBQ pork ribs, roasted chicken, fried noodles, nishime (Japanese vegetable stew), mashed potatoes, corn on the cob, pasta, tater tots, spring rolls, tempura fried onions and taro, a local staple. (Personally I love taro but it's an acquired taste.) Dessert includes apple cobbler, caramel bread pudding, cookies and mini pastries. Make sure to eat one of my favorite Hawaiian dishes, Laulau. It is pork and fish, wrapped in taro leaves (similar to spinach). which is then wrapped in tea leaves. It is then cooked along side the Kalua Pig in the underground Imu or steamed. You peel open the tea leaves and it reveals an aromatic and yummy present. Olelo Room - is Aulani's fun interactive lounge that offers continental breakfast, traditional afternoon tea and a Hawaiian inspired food menu. The cocktail service includes the “Ike Mua” (“Drink of the Day”) among tropical and classic cocktail such as mojitos, margaritas, sangria and Hawaiian beer and wine. Papalua Shave Ice - In the middle of the pool area at the Aulani Resort. $3.75. Flavors include Green Tea, Guava, Haupia, Lemon Lime, Li-Hing-Mui, Lilikoi, Lychee, Mango, Orange, Root Beer, Vanilla and Watermelon. Your on vacation, don't play it safe! Have up to three flavors, my favorites are Li-Hing-Mui (crack seed), Lilikoi (passion fruit) and Lychee (chinese fruit); also like Haupia (coconut) and Guava, but I'm allergic to Guava's, go figure. I grew up in Hale'iwa eating Matsumoto's Shave Ice, the "Meca" of Shave Ice. It's interesting that the Aulani Shave Ice Stand is named "Papalua". The street I grew up on is called Papailoa Road, (right next to Police Beach where Lost was filmed). Papalua sure sounds a lot like Papailoa! See my Hale'iwa Shave Ice blog here. So come enjoy some "Ono" grinds with us in paradise, it would be our pleasure! The Beach Villa Resort is located in West Oahu within the beautiful Ko Olina Resort. We offer luxurious vacation rentals with two and three bedroom villas right on the beach. Luxury hotel accommodations and amenities at condo prices. Luxury Condo Rentals in Ko Olina, Oahu, Hawaii. Licensed Hawaii Real Estate Agent; Homeowner at the property.